We had greek yogurt for breakfast every single day of our stay in Santorini and Milos. I can almost say with certainty you would not have had such delicious greek yogurt anywhere else. Surprised?? I didn’t think you would be! 🙂 Traditionally it is served with honey and in addition there are several topping available like fruits, almonds, walnuts etc. Now coming to the restaurants- here are a few restaurants out of the lot that we have categorized in accordance with food, ambiance and service. Yes, hard to imagine that a busy museum like Acropolis can have one of the best restaurants but it sure is true! Located strategically on the second floor terrace it gives you a panoramic view of Acropolis while you savor on some great food. 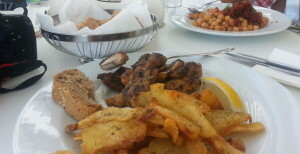 We ordered chicken, potato fries cooked with herbs and chickpeas salad. We gorged on this delicious food before heading to see the rest of the museum. After watching the beautiful sunset in Oia we dined at this restaurant that has breathtaking views of the ocean as well as of Oia. It was such a romantic setting under the moonlight that already delicious food tasted even better! We ordered a bottle of their house red wine, grilled vegetables, pasta and fish of the day. After a leisure stroll in Fira streets we decided to have dinner at this cozy place (also cheap eats!!) located on main street, away from the hustle bustle. 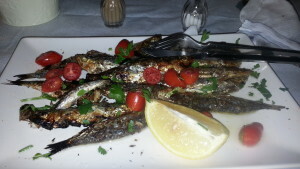 We ordered tzatziki, grilled vegetables and grilled sardines. Sardines were super fresh and tzatziki here was probably the best we had. We braved our way from Adamas to Tripiti on ATV late evening; pitch dark on some stretches, to have dinner at this highly reviewed restaurant which certainly didn’t disappoint us. This place has a great ambiance – outdoor seating in a beautiful garden with olive trees around and a nice water fountain. Food tallied the reviews we read, we ordered lamb kebab that was soft and supple, eggplant appetizer and peppers stuffed with rice were equally authentic in taste. On our way to Sarakiniko we hit this gorgeous restaurant by accident. It has an awesome view – facing Papakinou beach and outdoor seating is really cool amidst small garden like area decorated with earthenware and small fountains. We noticed a lot of restaurants in Greece have fountain in their seating area – looks like a good omen. Food here was not galactic, we ordered lamb and rice cooked in Greek style but their service and ambiance would make up for all the lost points. This is located right outside the ferry terminal one among many restaurants. 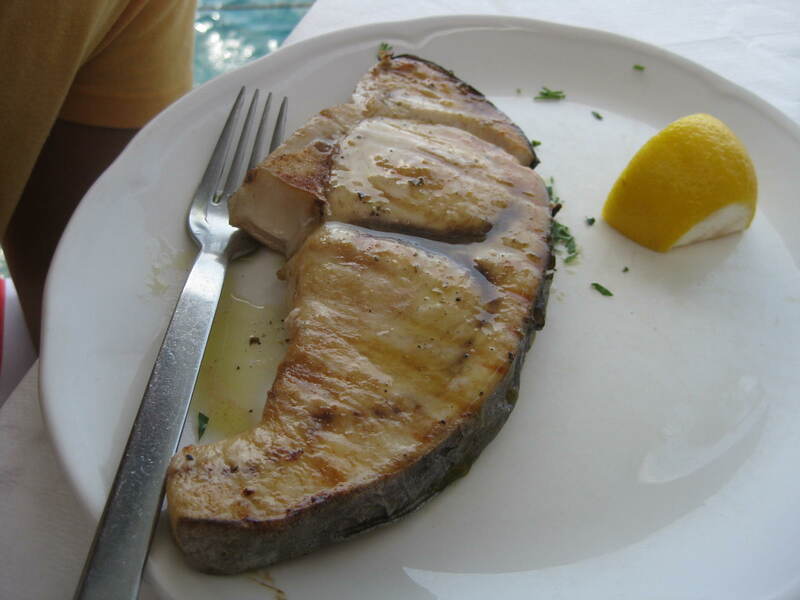 Run for several years by a local family we had great time conversing with the owner while sipping on the free Ouzo they served us 🙂 Bread that was served with our wine was soft, fish of the day – red snapper was super fresh and delicious. Being right by the bay you will find hoards of locals and tourists hankering around Amoudi Bay for fresh seafood. It would be unfair to expect a full fledged veg meal though you can still get some Greek salad, bread and olives, eggplant dip kinda food. We ordered grilled fish of the day which was indeed super fresh and well cooked and all the above veg dishes I mentioned. Thanks Jenny, those were absolutely delicious! Food at the museum was 1 of our favorite..